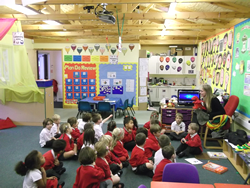 Bagshot Infant School is proud of the enriched curriculum it offers its pupils. Teaching is based around core learning in English and Maths. Other subjects, including Science, History, Geography, Religious Education, are taught throughout the school, and complement these core subjects. When children first enter school they are helped to settle happily and are encouraged to develop independence. They are introduced to a wide variety of activities suited to their individual abilities and stage of development. Children work on the ‘Foundation Stage’ of learning for the Early Years. In addition to beginning to write in a cursive style, the children are taught phonics (the link between sounds and alphabetic symbols) in a systematic and progressive way. We follow the DFE recommended Letters and Sounds phonics programme. We offer the children a broad range of reading books from reading schemes such as Oxford Reading Tree, Read Write Inc, Jelly and Bean and Rigby Star. We aim to inspire a love of reading, through an exciting and varied range of fiction and non fiction texts. We take a thematic ‘topic based’ approach to learning with a chosen theme being used to explore different areas of many subjects. Topics range from ‘Ourselves’ to ‘Materials’. Our inventive and imaginative approach to the curriculum ensures all children are engaged with and enthused by what they are doing. Weekly curriculum updates are sent home via ‘Peek at the Week’ by each class teacher. All teachers are trained to recognise the abilities of each child and to ensure that, through differentiated teaching, the range of abilities within the class group is catered for and that as a result every child meets its full potential. At Bagshot Infant School we encourage our children to lead a healthy lifestyle and promote healthy eating and exercise. We are ensuring that the School Sports Funding is being used to improve the quality and breadth of PE and sport provision we offer in our school. If you would like further information about your child’s learning please do not hesitate to get in touch.